A pair of friends from Seattle have joined Katey for a portion of her trip! 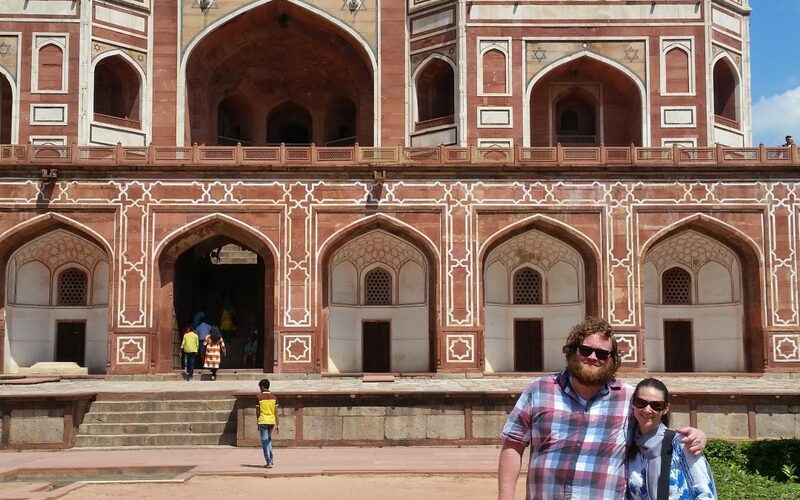 Tammy and Randy flew into Delhi very early in the morning, and are still recovering from the 12.5 hour time change. But, as Katey is a task master, they were up and out in the morning into the city! We took it easy and ran a couple of errands and experienced the full force of Delhi summer while in the rickshaws around town. Randy had informed Katey before they arrived that he would like a couple of shirts made, so their first adventures were through the markets to buy fabric, then to our friends at Sunshine Project for Kuku and his team to work their magic. The heat, and more precisely the humidity, makes travel a bit more difficult this time of year, particularly if you aren’t used to the weather. We took care to stay hydrated, but being outside when it is 95 F with a “real feel” of 114 F, is taxing on energy, thinking, and tempers (but that might just be Katey). This is especially true when sitting in the gridlock of Delhi traffic in a rickshaw. Luckily, we were able to take the metro for a portion of our journey which is not only cooler, but surprisingly clean and affordable. When asked about their first impressions (a future post will delve more into this topic as they had some interesting observations), they both noted that it was as expected in regards to traffic, the crowds of people, and the aroma. Tammy observed that while India has a particular smell to it, it isn’t usually unpleasant, just distinctive. She recalled it immediately from her visit 3 years before.